Drywall work is one of those inescapable realities of home remodeling. Any kind of wall work seems to lead to drywall patching. And even projects that have nothing to do with walls, like electrical and plumbing, can result in drywall cutting, patching, and joining. In order to join two sheets of drywall, you must first tape over the seam before applying joint compound. In a perfect world, you could embed joint compound (also known as mud) alone into the seam. Unfortunately, the two sheets will eventually loosen and move just enough to develop hairline cracks in the joints. Slowly the joints will start to crumble. Drywall tape reinforces joints and lets the mud do its work. But which drywall tape is best? Paper joint tape is exactly as the name says: long strips of paper, usually in rolls of 75 feet or more. A slight lengthwise factory-made crease in the paper helps you fold it down the middle when using it for inside corners. Paper tape takes some skill to learn. You need to first prepare the wall with a thin strip of drywall mud, a process known as bedding. After that, you lay down the joint tape, firmly pressing it to remove air bubbles trapped underneath. After it dries for a few hours, then you add another, the final layer of mud. When fiberglass mesh drywall tape came on the market, it was touted as the once-and-final replacement for paper drywall tape, mainly due to its incredible strength. Mesh drywall tape is nearly impossible to tear since it is composed of fiberglass threads woven together into a tape-like form. But it does have its downsides: it is gummy and hard to handle, plus it is significantly thicker than paper joint tape. An improvement over the thick mesh-like fiberglass tape is another fiberglass tape that is vastly thinner and easier to handle: ultra-thin fiberglass tape. This market is dominated by one product, FibaTape Perfect Finish, a mesh tape that does not have the thready qualities of classic mesh tape. Instead, ultra-thin drywall tape is more like a fine mesh similar to fabric. Because it has more threads, there are more intersection points between the threads. This helps make the tape stronger than the coarser mesh drywall tape. FibaTape manufacturer Saint Gobain claims that FibaTape is 30-percent thinner than paper tape. Given the thinness of the two products, this may be a moot point. But it certainly does solve the problem of regular mesh fiberglass tape bulges under the mud. Take your average paper tape, lay down two strips of very thin metal running the length of the tape, and leaving a small gap between the metal. That's your average metal-reinforced paper drywall tape. Truly a niche product, this drywall joint tape is categorized as an inside corner bead tape because it cannot be used on flat surfaces or even on outside corners. Metal drywall tape is meant to be creased lengthwise and then applied to the corner. Because it comes with a crease, it is easier to crease than ordinary paper drywall tape. Paper Tape vs. Mesh Tape: Which is Better? It is tempting to use fiberglass tape for all applications. But professional drywall workers still veer toward the paper tape. When combined with drywall compound, paper tape provides a perfectly adequate joint. What I am finding confirms my experience with the mesh products. I repair more joints that have cracked, both factory and butts, than almost anything else. Very often, I will be called to repair other problems and I find cracked mesh joints like crazy. I never use the product. Every time I have experimented with it, it cracks. First, it is not designed to be used with regular joint compound. It is supposed to be used with setting compound like EZ-Sand or Duro-Bond. These dry harder and are more resistant to cracks. Consider whether you are working on a tapered seam or a flat seam. Tapered seams are where the two tapered edges of drywall meet, forming a shallow valley. The thicker mesh tape will fall below the level of this valley and can be covered with drywall compound. 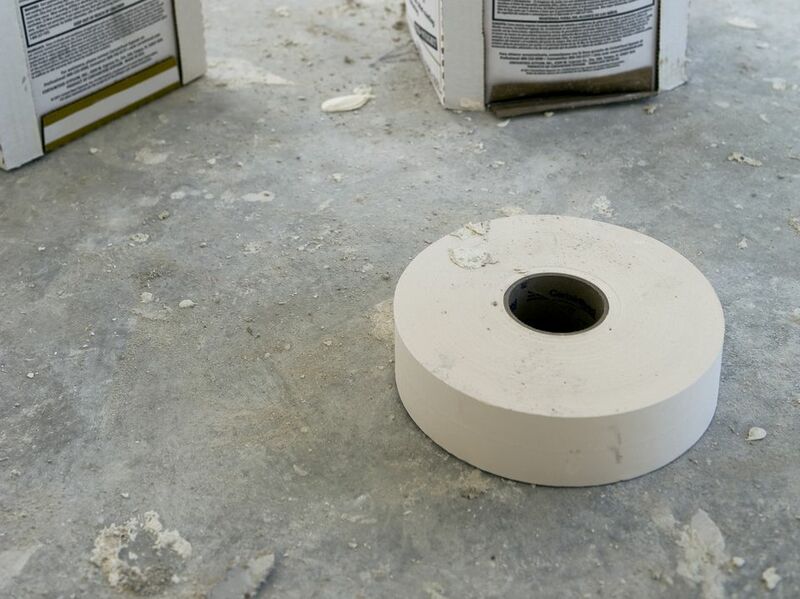 If you are working on a flat seam, also known as a butted seam, you may need to use paper tape or thin fiberglass tape. Otherwise, the thicker mesh joint tape will stick out too far and look lumpy. If you have joints that will be subjected to stress, you may want to consider either type of fiberglass mesh tape. Corners near doors and windows are considered stress points. Inside corners need paper tape. Better yet, you may wish to use metal-reinforced paper tape. It is impossible to apply fiberglass mesh tape to inside corners.